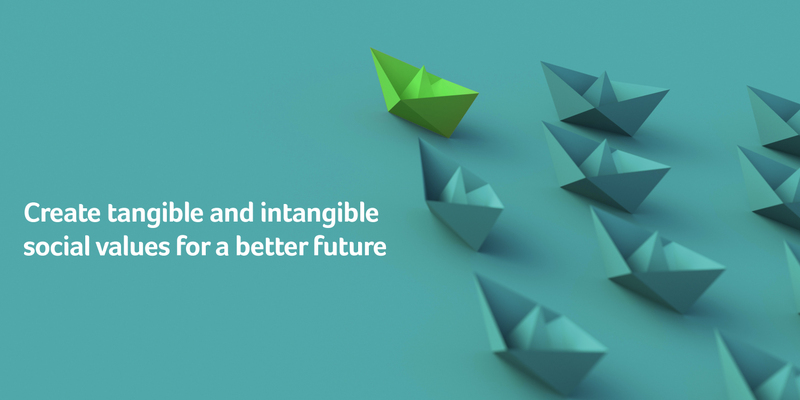 While pursuing profitability, leading transformation, and providing innovative services, we will continue to create tangible and intangible value while focusing on our three core beliefs of creating value, balancing interests, and developing sustainably in order to promote sustainability model transfer and leverage our social influence as we become a future-oriented business. 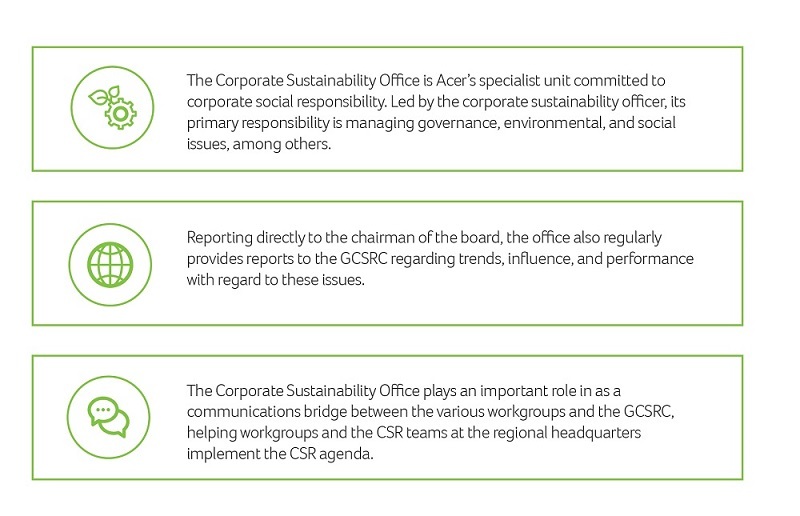 In addition, in line with the transformation of the company, we have also adjusted the existing Acer CSR policy to include three aspects: Integrated sustainable governance, pioneering green innovation, and comprehensive sustainable impact. The development of Acer’s CSR began with a preparatory period between 2005 and 2007, wherein we began integrating environmental issues into our sustainability concerns. Between 2008 and 2010, we laid the foundations of our CSR management mechanism, along with incorporating labor and ethics issues into our supplier management. 2010 through 2014 was our strategic promotion period, during which time concepts of sustainability were incorporated into all the company’s operating mechanisms and compliance with international trends in sustainability became a focus. This is being followed by our 2015 to 2024 value creation period, during which we are reviewing the overall environment and the expectations of our stakeholders to plan Acer policy in terms of CSR implementation over the coming decade. We hope this will further deepen the integration of the organization and the overall value chain, gradually building toward strong governance and innovation development goals that serve as a model for the industry. Concrete Actions Taken in 2017: Building on 2016’s incorporation of social return on investment (SROI) methods, we calculated the non-financial performance of social concern programs, working to optimize the investment of social resources and deepen sustainability strategies, thus leveraging greater social influence. In 2017, we held the Acer Corporate Social Responsibility Project Awards, further building on non-financial performance management and employing SROI concepts in the judging thereof. Through these awards, we showcased the social and environmental benefits created by our staff around the world in concert with stakeholders. Concrete Actions Taken in 2017: The United Nations Sustainable Development Goals (SDGs) provide an important guidepost for the sustainable development of humanity as a whole. As a citizen of the world, Acer actively strives to connect our technologies, products, and services with the UN SDGs, using our core competencies to address the needs of society. In 2017, we took specific actions to address 9 of the SDGs through elements including healthcare, smart cities, and smart transportation. For details, please refer to chapter 4 of this report. Into the future, we will continue to invest in solutions that look to the UN SDGs, using technology, products, and services to guide innovation and realize Acer's sustainability blueprint. Concrete Actions Taken in 2017: Together with MediaTek, Advantech, and several other major companies in the field, Acer is a founding member of “Asian Silicon Valley for the Internet of Things.” This alliance was created as part of the “Asia Silicon Valley” initiative launched by Taiwan’s National Development Council, which is focused on two main axes: Promoting innovation and development in the Internet of Things industry and building a robust innovation and entrepreneurship ecosystem. Mr. Stan Shih, Acer’s founder, was selected as the honorary president of the alliance for his important place in the development of the technology industry in Taiwan. The focus of this alliance is on plants, startups, associations, and federations within the IoT field, inviting public-sector associations to participate as needed to help foster innovation and plan for the creation of a new industry around IoT applications. The alliance hopes to take on the needs of the industry head-on, from technology R&D and field verification to international exports, building a “national IoT team” for Taiwan and moving into the international market. By creating a platform for the industry, the alliance aims to incubate cooperation between startups, systems, and fields, fostering a proliferation of new entrants to the industry. In 2017, the alliance convened four meetings, publicly soliciting for members and proposals in areas including self-driving cars, AI, mobile lifestyles, smart transportation, smart medical care, and IoT application platforms, providing subsidies for tenders through national programs. In order to broaden the scope of corporate social responsibility governance and incorporate sustainable development strategies in daily operations, in 2012 the Global Corporate Social Responsibility Committee (GCSRC) was established. The members of the GCSRC include senior management in regional departments and major business & functional units. To promote effective communication across global locations, we have put in place executive secretaries for corporate social responsibility in each regional headquarters. These executive secretaries are tasked with representing each region on the committee. 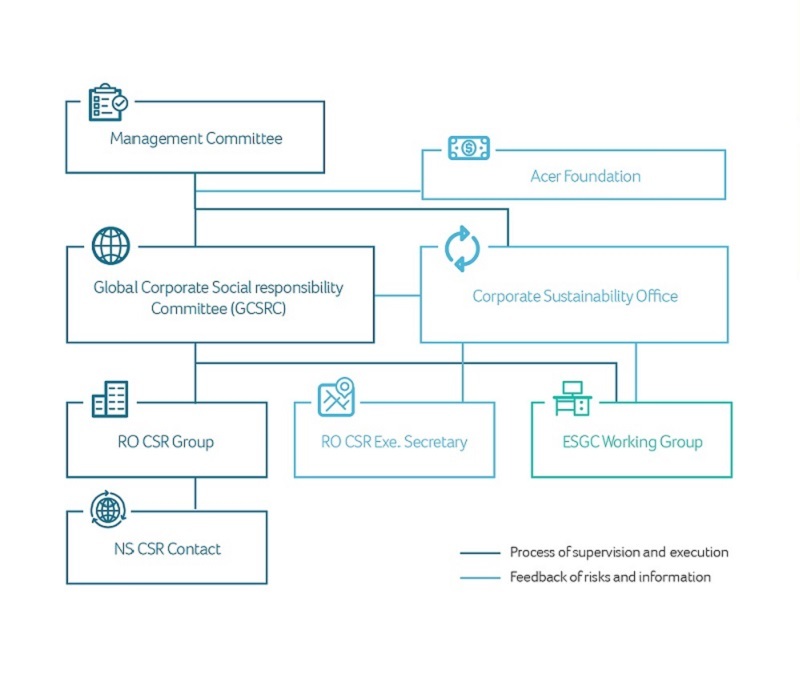 The GCSRC meets regularly to help improve the effectiveness of Acer’s implementation of corporate responsibility and build consensus around global CSR operations by assessing CSR-related risks & opportunities, evaluating CSR performance, and sharing CSR experience. Acer takes a proactive attitude to reviewing and promoting important sustainability issues and strives to incorporate sustainable development policies into daily operations. We have established a CSR governance pipeline for the communication of relevant issues, fully implementing a variety of resolutions and continuing to pursue stronger corporate social responsibility governance. In September 2017, we held a global discussion meeting aimed at CSR teams from our regional headquarters, discussing trends and performance in CSR-related issues and facilitating the sharing of regional experience. During this meeting we also set out how our Corporate Social Responsibility Project Awards would be conducted, along with a timetable for them, beginning with the nominations and selection of entrants for the first Global Corporate Social Responsibility Project Awards. Passion, user-centric, innovation, teamwork, balance of interests, and integrity are our core values, which compel us to consistently strive to create value by being pioneering, fast and effective. These core values also drive us to constantly deliver what customers want in an ethical and caring manner. This is reflected in all that we do, in every decision and every action taken by each and every one of us. We continue to build on our reputation for trust, integrity and honesty, both internally and externally, by embracing people, diversity and different culture. As a responsible corporate citizen, we respect human rights, involve ourselves with local communities as well as comply with laws, environmental regulations, ethics, safety standards and social norms. We believe in turning slogans into reality by demonstrating our actions through our core values. Inspired by these values, we have formulated a Standards of Business Conduct (SBC) document to guide us on how we interact with each other, our customers, our business partners, our shareholders and the communities where the Acer Group does business. The reputation and success of the Acer Group depends on the individual and collective integrity of each one of us. Adherence to the guidance in this document is required by all Acer Group employees around the world. Its implementation is monitored rigorously and managers are held accountable for ensuring that all employees are aware of these principles and abide by them.